As the organic movement gains ground, more people are appreciating its benefits—not just to health, but also to the environment. This 'fashionable' entrepreneur tells us how. “Our initial intention was to farm our own vegetables for personal consumption so we could be sure that no toxins or harmful inputs would be introduced in the process,” says fashion designer, businesswoman, and mother of three, Hindy Weber-Tantoco on how the plot of land adjacent to their Sta. 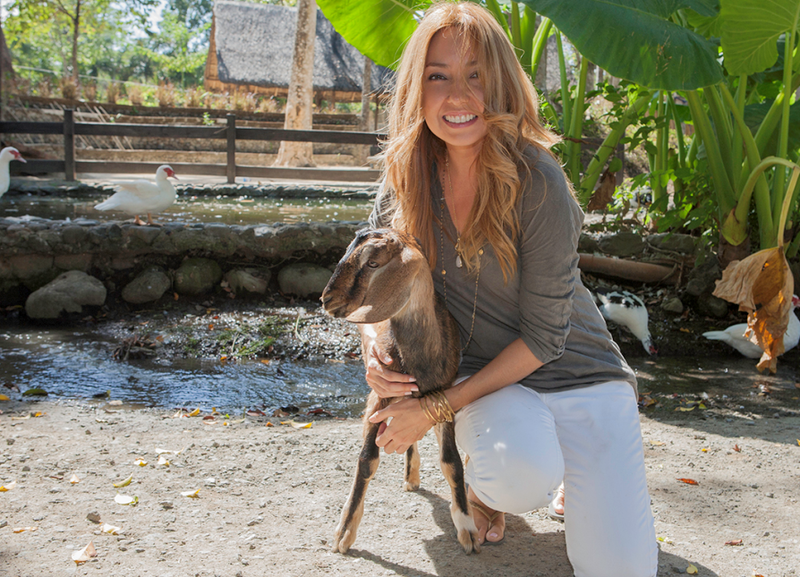 Rosa, Laguna home transformed into her family’s source of organic produce. Hindy began Holy Carabao Holistic Farm with her husband Gippy, when they planted their first crop in November 2009. “Shortly there after,” Hindy recalls “we decided to offer [the produce] to others who felt the same way about their food intake,” referring to the practice of consuming produce grown through environmentally sound processes, without any use of artificial or chemical pesticides and fertilizers. “Generally,” says Hindy, “we think that eating veggies is good for our health.” And as our mothers have ingrained in our minds, that’s partly true. “But there’s (also) a lot of produce that’s been infused with chemicals to fertilize them, to resist pests, to beautify, and to preserve. We take in those chemicals when we eat veggies, and those chemicals can harm us or eliminate the nutritional value of the produce.” Hence the need for organic produce. Starting with a 1,000-sq. m piece of land within the exclusive Sta. Elena golf and residential village that Gippy manages, the two eventually expanded the farm to a total of 4,000 sq. m. They began with three farmers, “one of whom was a trained organic farmer,” according to Hindy. They built a small facility to produce vermicast (organic fertilizer made from recycled food waste and worm castings) and organic compost. The two carabaos on the farm, affectionately named Kisses and Choc-nut, helped prepare the soil for planting. 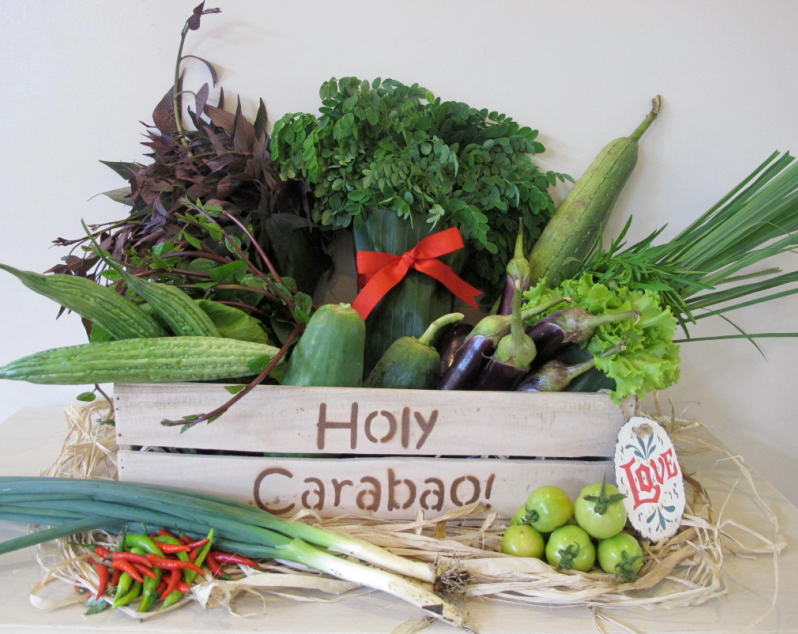 Holy Carabao offers everything in the traditional Bahay Kubo song and a little bit more: from tomatoes, eggplants, and carrots, to sweet potatoes, spinach, and lemon grass—all organically grown, of course. In the beginning, “we offered our produce to family, friends, and colleagues who were also concerned about the kind of food they ingest,” says Hindy. Soon, “we got some orders and started delivering to homes in July of 2010.” And early this year, they also began to supply to Rustan’s Supermarket in several of their Makati outlets. “Biodynamic goes a step further by recognizing that produce also imbibes the life forces of the energy of the natural environment, such as the cycles of the sun and the moon,” says Hindy. And while all this may seem very New Age, her reasoning is actually logical: “When we ingest produce in which the life forces have been allowed to strengthen, we, in turn, strengthen our own life force.” She adds, “There are biodynamic solutions to apply to the soil to gradually restore its original richness, there are also hours of the day in which it is better to plant and harvest certain crop in order to maximize the absorption of energy from the sun and the moon.” All that to make a carrot better than your supermarket variety.